A documentary was being filmed by Ralph Goertz, the head of IKS – Institut für Kunstdokumentation – in Dusseldorf. 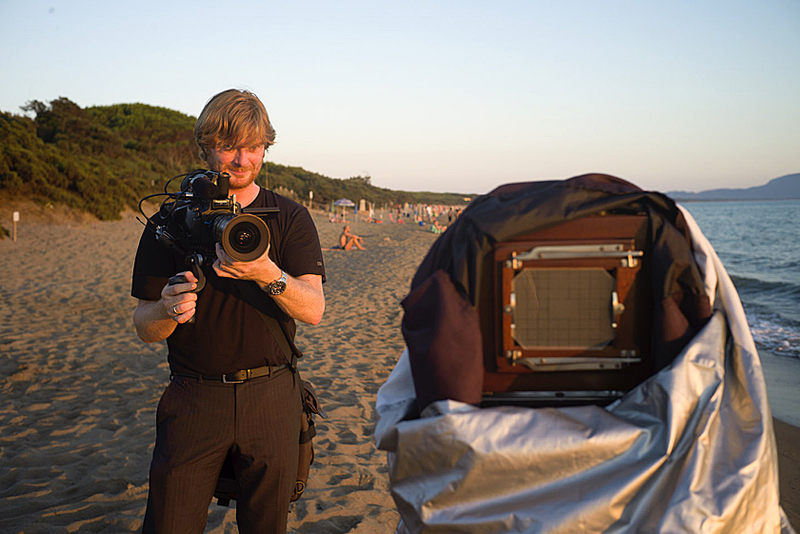 We had been working on this for several years and he came down to Tuscany to film me working with the view camera along the coast. He’s made over 70 documentaries about artists, but mostly about photographers. He’s an amazing, easy going, and balletic filmmaker. Last year, at my Retro show in Dusseldorf, the film premiered at NRW Forum where he was also the curator for the show. It’s always fun to turn the tables on someone who is filming you and do it back to them. If nothing else it becomes a record of the moment, and that has value too. This entry was posted in Beach, Light, Portrait, Video and tagged portrait, Sea Shore, Tuscany, Video on August 11, 2015 by joelmeyerowitz2014. Yeah, I got your DVD ‘Sense of Time’. It looks like you both had lots of fun those filming days. I feel the photographer (you) is talking to me so I guess Ralph’s transparent quality is a high praise for a documentarian.